If you’re like a lot of golfers, you have a love-hate relationship with your fairway wood. Love, because it’s easier to hit than your driver and when you catch it, it flies high and long. Hate, because, well, you don’t always catch it. Especially that 3-wood. But never fear, with all of the options on the Hot List, this year could be the year you conquer your fairway woods. The fairway woods that earned medals on our Hot List have the technology to help you get it in the air, hit it far and straight. We know your swing isn’t perfect – none of ours are either – so to help combat the imperfections, faces on a lot of these fairway woods are thinner and some even wrap around, making more of the face behave like the sweet spot in the center. So even if you make contact low, to the left or right of center, there’s technology there to bail you out. There are also slots in several of these models to help the face flex more, increasing ball speed across the entire face. It’s obviously going to work best if you hit the center of the face, but if you don’t, you’re still going to be pleased with the result. On the crowns, you’ll see a lot of carbon fiber. Subbing in a lighter material allowed engineers to save some weight and then redistribute it low and back. Putting the weight back there makes it easier for you to get the ball up in the air. Another byproduct of putting weight low and back is that spin is reduced. If the ball is spinning less, it’s going to travel further. So, if you’re opting for a fairway wood off the tee or trying to reach a par 5 in two, you’ve got the technology you need to get it up and out there. We can’t say it enough: Go get fit for your clubs. If for whatever reason you choose to not listen to us, there’s enough adjustability on many of these fairway woods for you to do some tinkering of your own. 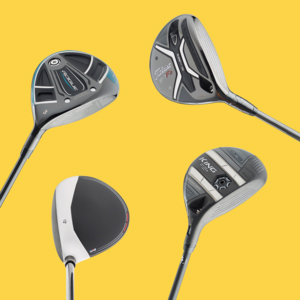 Adjust the loft and draw and fade biases, and you’ll have the fairway wood your bag has been missing in no time.